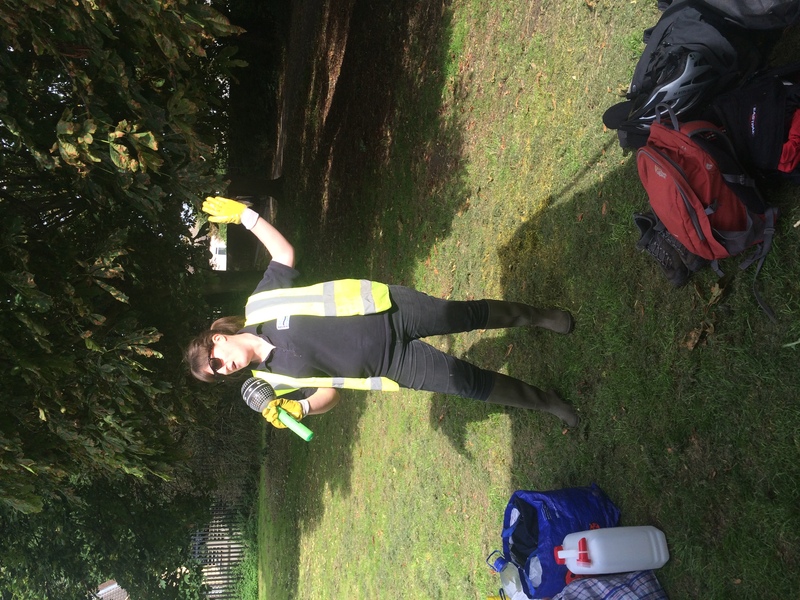 September saw our final Capital Cleanup event in Ravensbury Park kindly funded by the Mayor of London’s Capital Cleanup fund and the Living Wandle Landscape Partnership. 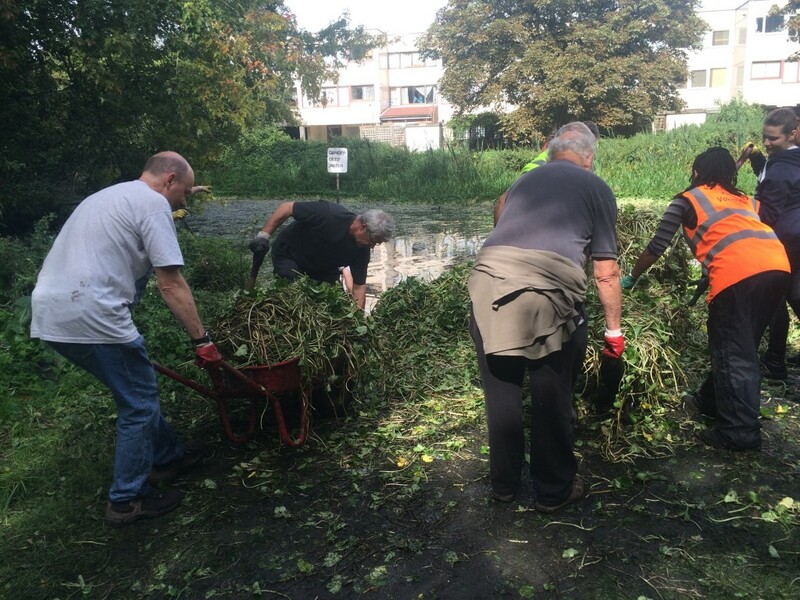 As traditional for our September cleanup, we were joined by Friends of Ravensbury Park who had their eyes set on clearing the infamous floating pennywort from the lake. They really had a big task ahead of them! Luckily we were also joined by a keen team from ZipCar (our van suppliers) who under the supervision of the Friends of Ravensbury Park, headed straight to the lake to battle the aquatic menace. The rest of our cleanup team headed to the river to clear rubbish throughout the park. 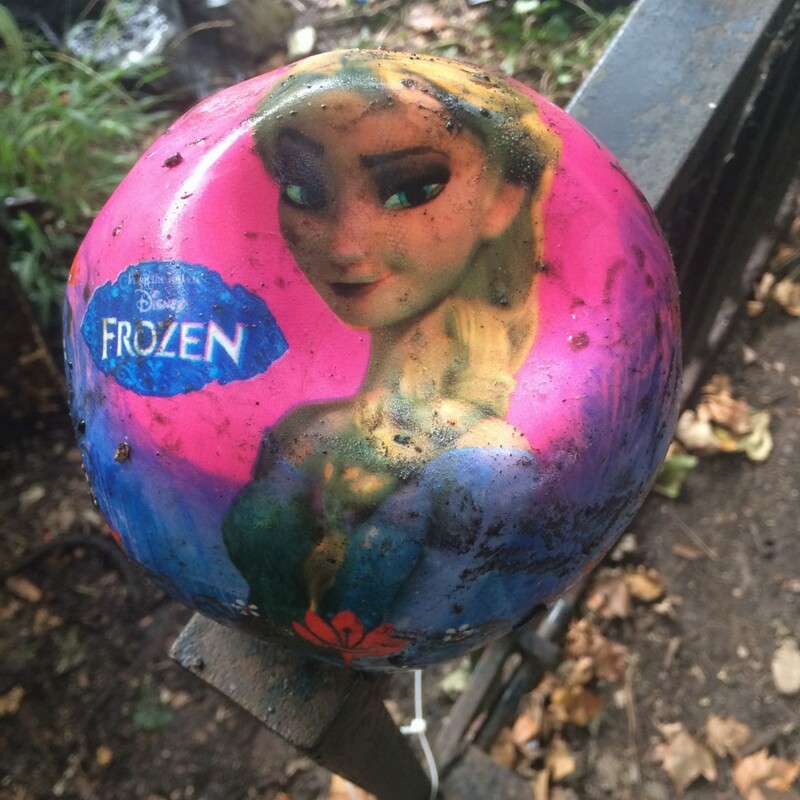 Quickly discovering plenty of rubbish lurking in the depths including this Frozen football – perhaps I’ll save it for a Christmas present for my little cousin, after cleaning it of course! 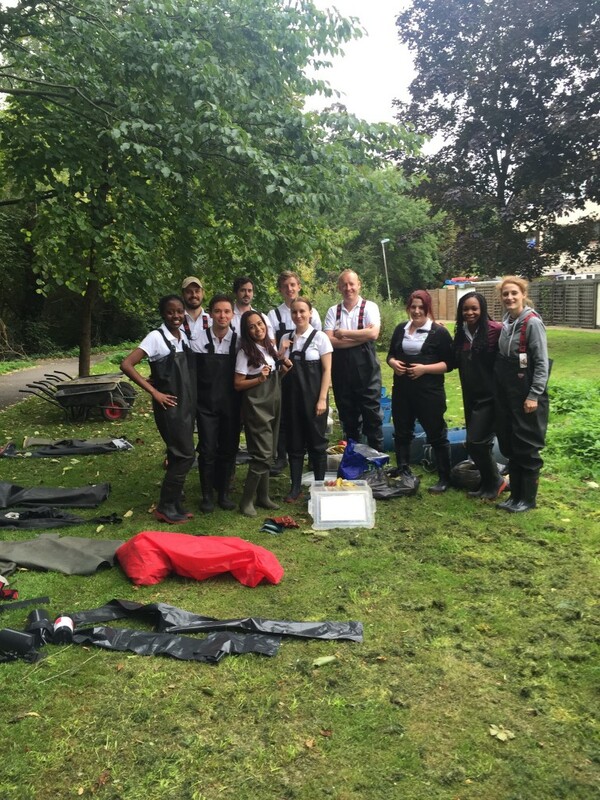 Meanwhile, the ZipCar team were finally learning what we get up to when we book their van once a month. Muddy, muddy work. 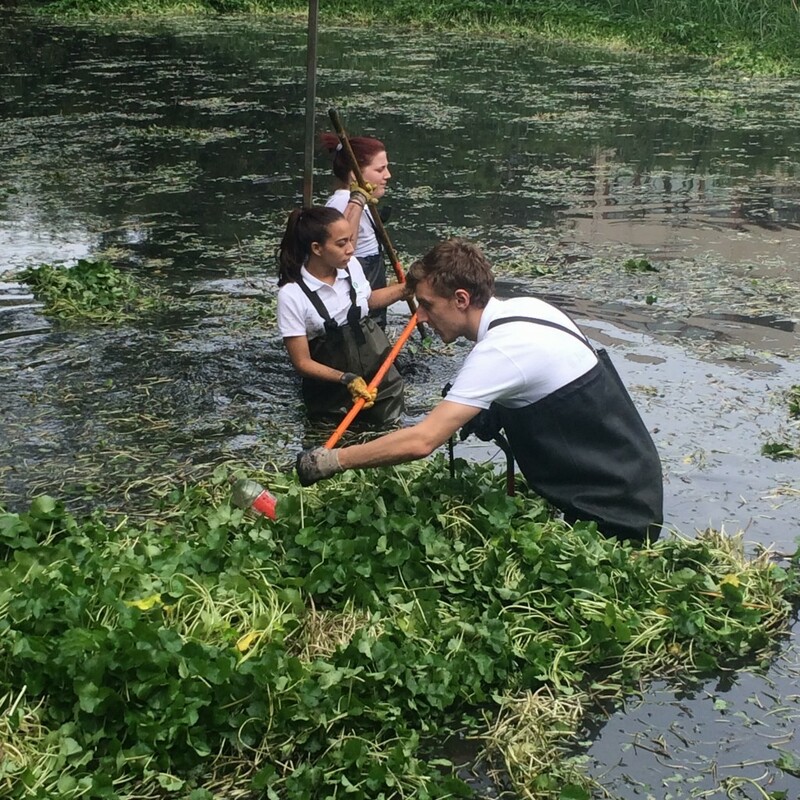 Without much persuasion, several members hopped in the lake and got stuck in, sawing and towing pennywort to the jetty while the others dragged the plant out and ferried it to the impressive dumping pile. Lunch came around giving everyone a welcome break from the hard work of the morning. 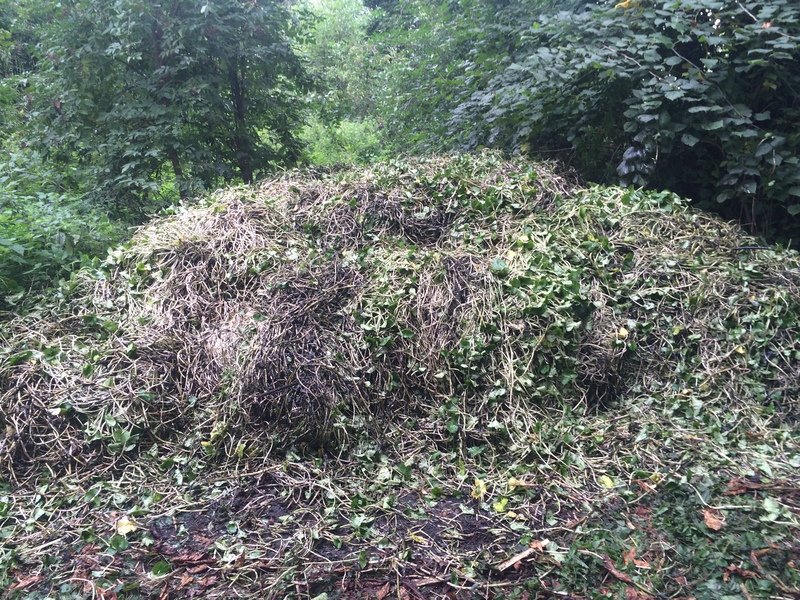 But with so much pennywort, the break couldn’t last forever…. 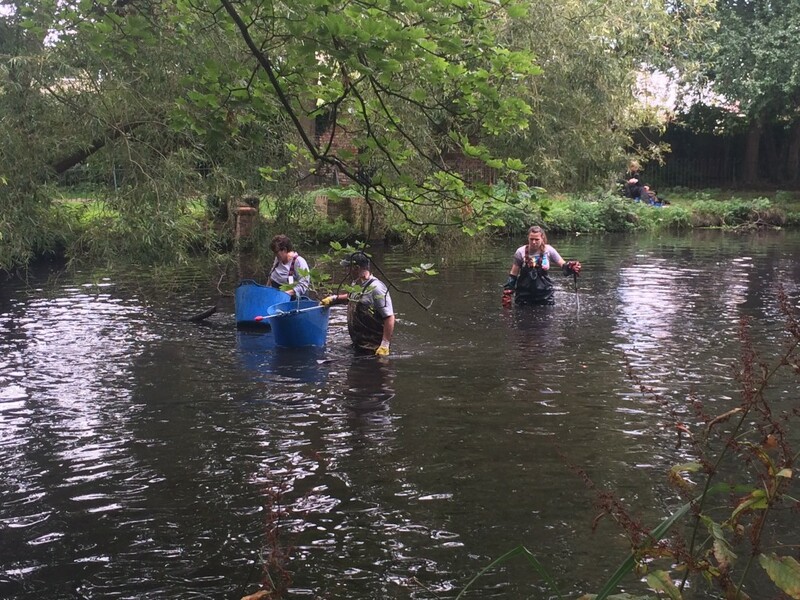 The wading team were making great progress and headed down the back channel to check for rubbish. 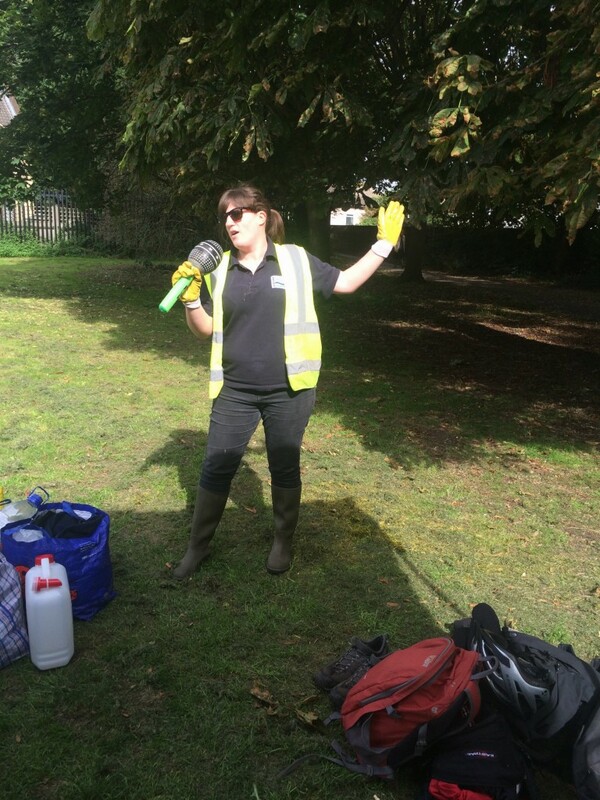 In the afternoon, my favourite find was discovered – an inflatable microphone which got me in the singing mood. Luckily, no one was around to record my rendition of Taylor Swift. Thank you to all the volunteers who came along to our event! So what did we find? 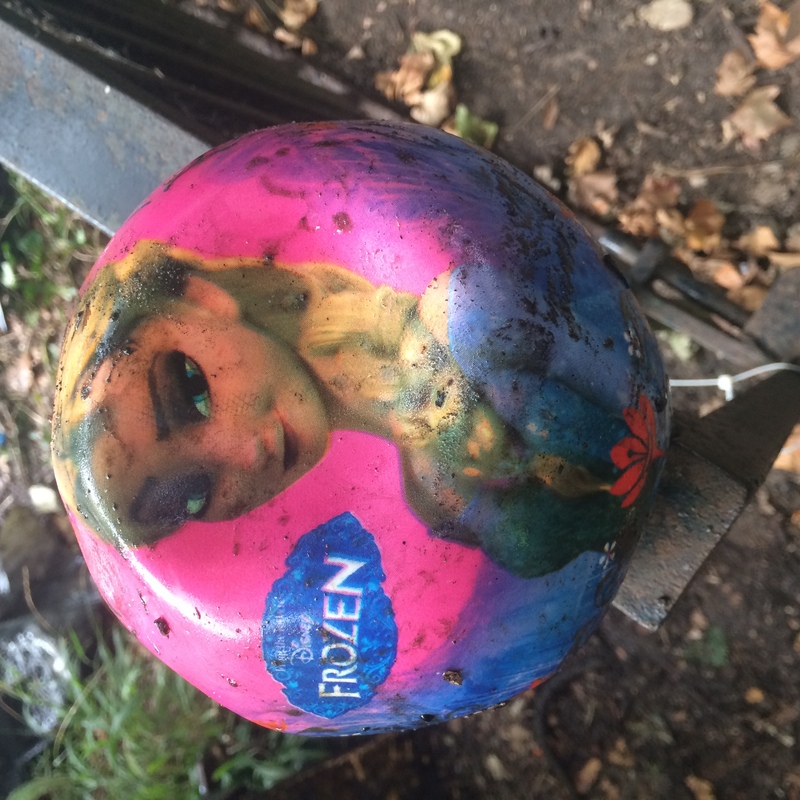 1 Frozen football, 1 Mickey Mouse ball, 1 other generic ball, 1 fire extinguisher, 1 rope wheel, 1 bike wheel, 1 set of trolley wheels, 1 dustbin lid, 1 net, 1 inflatable microphone, 1 giant iron bar, 2 car seats, 2 scooters, 3 buckets, 14 tyres, 30 bags of other junk along with barrows and barrows and barrows and barrows of floating pennywort. Seriously… there was a lot! Huge thanks to everyone who helped pack up van after the event and John for supervising the Event Tent; Wally, Theo & Dave for helping supervise everyone on the day, Friends of Ravensbury Park for leading the floating pennywort team, ZipCar for waiving the van’s fee for the day and the Waste Management Team at Merton Council for organising collection of all the rubbish the next day. 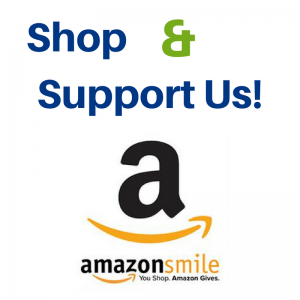 Thank you to all our volunteers for coming: Aaron, Abi, Agnes, Alex, Alison, Andrew, Ann W, Barry, Ben, Camille, Charles, Charlotte, Chris S, Dave J, Dave W, Derek, Dimal, Flora, Fred, Fumbi, Gina, Ian, Ida, Isabelle, Jan, Joe, Johamm, John L, John N, Keith, Khin H, Khin T, Laura H, Louise, Marta, Michael R, Michael S, Naomi, Niki, Paul, Renah, Richard, Richard B, Rose, Sabiha, Sally, Sanya, Sarah A, Sheree, Sophie C, Sophie O, Stewart, Sue, Theo, Tim, Victor, Victoria, Wally, Wayne and Will. So what did I learn from this month’s cleanup? 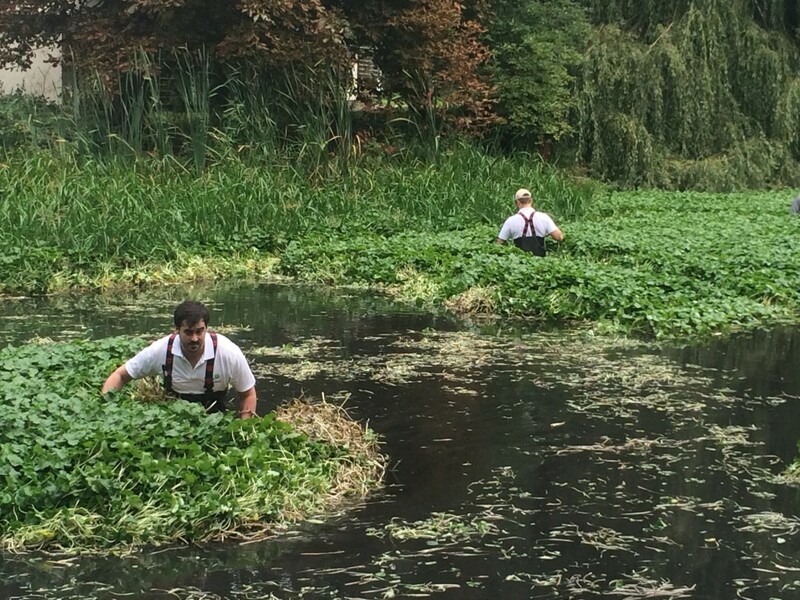 White uniforms will always become brown when handling floating pennywort. 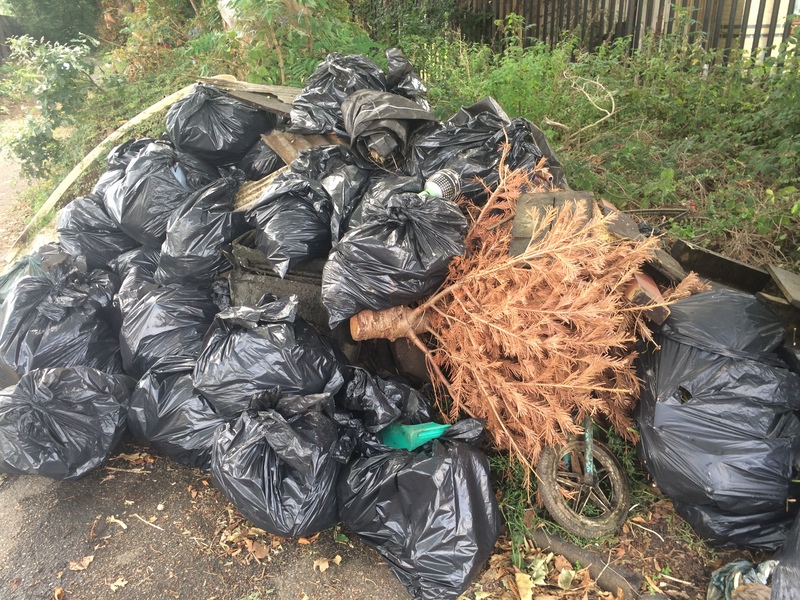 This entry was posted in Uncategorized and tagged Capital Cleanup, Cleanups, Events, floating pennywort, INNS, Living Wandle Landscape Partnership, Ravensbury, Ravensbury Park, Spreading the Wandle Word, Volunteer, Wandle, ZipCar on October 13, 2015 by Polly.